*MASSACHUSETTS - and the nation - lost one of the great ones last week. 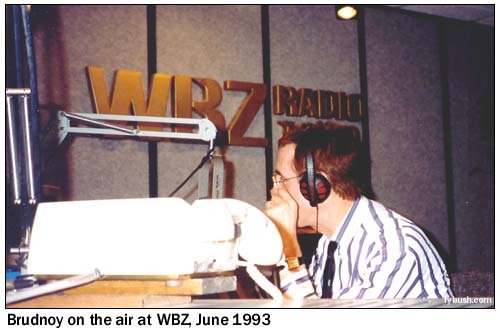 Since 1976, David Brudnoy had entertained, educated and, often, irritated audiences on WHDH (850), WRKO (680) and - starting in 1986 - the 50,000-watt night signal of WBZ (1030 Boston). In 1994, Brudnoy came to the nation's attention when he revealed that he was suffering from AIDS. After a viral infection related to the disease put him in a coma for nine days and kept him off the air for ten weeks, Brudnoy returned to the air with a reduced shift (7-10 PM instead of 7-midnight), a new studio (in the library of his Back Bay home) and a profile raised by appearances on national TV and the publication of his memoirs, Life is Not A Rehearsal. Brudnoy's illnesses continued to take him off the air occasionally in recent years, but it quickly became clear that his latest absence, which began on December 1, was a serious one. Last Wednesday, Brudnoy gave an interview to WBZ anchor Gary LaPierre in which he announced that his Merkel cell carcinoma had spread to his liver and kidneys and that he did not expect to live more than a few days. Wednesday night's Brudnoy show, hosted by former WBZ personality and close Brudnoy friend Peter Meade, took the form of an on-air wake, with Brudnoy listening from his room at Massachusetts General Hospital as politicians, authors and average listeners called in to say how much Brudnoy had meant to them. At 6:11 the following night, Brudnoy succumbed to his cancer. He was 64. That's the outline of the story - but our appreciation for Brudnoy this week must go deeper, for David was not just a voice on the radio but a treasured colleague, teacher and friend. Dr. Brudnoy was, for one thing, one of the most educated people to sit behind a microphone anywhere in New England radio. He held a doctorate in Asian studies from Brandeis University, and his undergraduate education at Yale took place alongside notables such as Christopher Buckley. It was not uncommon to hear David, a native of Minnesota, reminisce about school vacations spent at the mansion of Buckley pere - and it wasn't a matter of pretension, either; it was just the person David was. While five hours of talk radio (or even, later, three hours) was more than enough to occupy most people full-time, it was just one of the many facets of the man known to his friends and colleagues as "Bruds." He delighted in teaching communications courses at Boston University, a job he carried out long after his health began to fail in 1994 and a job he continued right up until his death, correcting papers from his hospital room. He was an avid movie buff, reviewing new releases for the Tab chain of community newspapers. He was a world traveler, even in the late stages of his illness, and even though he didn't hold a driver's license. It was not uncommon for Bruds to hire a WBZ producer to drive him down to Cape Cod on summer weekends, and it's fair to say he was on a first-name basis - as a customer - with many of the cab drivers who listened to him every night. And no obituary of David Brudnoy would be complete without mentioning the unique sound of his broadcast. In a talk radio environment full of bombast and vitriol, the David Brudnoy Show was an oasis of civility. David was, as he was never shy to proclaim, a libertarian, with regular and well-principled criticisms of Democrats, Republicans and independents through the years. But his show always allowed a voice to those who disagreed with David, and the outpouring of affection for David at the end is a tribute to the openness of the forum he gave to those on every corner of the political spectrum. David's show valued intellectual argument and gave no corner to the sort of empty-headed name-calling that has come to characterize so much of the rest of the talk-radio dial, and it was, and is, irreplaceable. *There was other news, in MASSACHUSETTS and elsewhere, ill-equipped as we were to deal with it in the face of the sad news from WBZ. Over at sister station WODS (103.3 Boston), veteran New England programmer Pete Falconi (late of Worcester's WXLO) takes over as music director and midday host, filling the shoes of the departed Sandy Benson. Out west, we note the passing of Bob Berger, former manager at WREB (930 Chicopee) and WMAS (1450 Springfield) and former GM of WHYN radio and TV. Berger died Saturday (Dec. 11) at his home in Wilbraham. *In MAINE, the WTVL calls returned to the dial at 1490 in Waterville after a brief interlude as WODJ. Citadel had been parking those calls on the Waterville station after moving them off its 107.3 in Greenville, Michigan, in the Grand Rapids market; it's not clear to us that they were ever even actually used on the air in mid-Maine. *In NEW HAMPSHIRE, WQLL (96.5 Bedford) has hopped on the all-Christmas bandwagon, we're told. And up in Concord, there's a shift in the ownership transfer at WKXL (1450 Concord); instead of passing from Warren Bailey's Embro group to a partnership of WKXL GM George Stevens and former senator Gordon Humphrey, a transaction the FCC approved back in July, Embro has now filed to transfer WKXL to Humphrey alone (doing business as "New Hampshire Family Radio LLC"). *In CONNECTICUT, WKSS (95.7 Hartford) brings Frankie V south from WJBQ (97.9 Portland ME) to be its new night jock, replacing the departed "Stick" (now in Cleveland at sister "Kiss" WAKS); meanwhile, Adam Axe moves from late nights to midday, taking PD Rick Vaughn off his airshift. *On any other week, the sudden death of a veteran upstate NEW YORK morning man would have been our lead story, and we're saddened indeed to have to report the passing of WBEE (92.5 Rochester)'s Bill Coffey. Bill started at WBEE in 1988, not long after the station flipped to country, and he held down mornings there until he was forced to return to his native southeastern Pennsylvania to care for his ailing father. Three years later, the departure of his successor, Fred Horton (now in Erie, Pennsylvania at WXTA) created an opening at WBEE, and thanks to the modern miracle of ISDN, Bill was once again hosting the "Coffee Club," this time from the comfort of his home in Glenmoore, Pennsylvania. The show worked, though, thanks to local co-host (and WBEE veteran) Terry Clifford and frequent visits to Rochester by Coffey. After a show last Monday that went without a hitch, the staff at WBEE was shocked to get a phone call later in the morning saying that Bill had suffered a heart attack, collapsed and died. He was just 56; he leaves behind his wife, Barbara, and three children. Tuesday's show was devoted to remembrances of Bill from his listeners, friends and colleagues; for now, Terry and news guy Steve Hausmann are holding down the morning shift while the station regroups. *There's still more sad news from elsewhere in the Empire State: Dawn "Break-a-Dawn" Blackstock Flemming, who spent most of her radio career at Buffalo's WBLK (93.7 Depew) before heading down to Orlando and mornings at WJHM (101.9 Daytona Beach) last year, died December 8 from complications from giving birth to her first child. Flemming is survived by her newborn daughter, Toni, and her husband, Tony. She was just 31. And one of the first sports talkers on New York's WFAN (then on 1050) has died. Pete Franklin was a legend in Cleveland, where he was the star personality on then-WWWE (1100); he came to New York in 1987 amidst high hopes for the brand-new all-sports format that WFAN was pioneering. Illness kept him from appearing on the FAN until several months after the station's launch, though, and he never found the success there that he had enjoyed in Cleveland. In later years, Franklin appeared on San Francisco's KNBR (680) and eventually returned to Cleveland at what had by then become WTAM. He died Nov. 23 in San Luis Obispo, California, though his death was not reported until last week. Franklin was 76. Hey, hey, he's a morning host: Yes, we know we're not the first to make the joke - but when WCBS-FM (101.1 New York) names ex-Monkee Micky Dolenz as its new morning guy, what do you want from us? Dolenz starts his new gig January 10. Over on the AM side, WCBS (880 New York) is now streaming its all-news programming; could other Infinity news-talkers follow? In Kingston, WGHQ (920) flips from standards to talk, with the local morning show continuing. Up in the Glens Falls market, WNYQ (105.7 Queensbury) is stunting; we believe this is a preface to its move south to Malta and its entrance into the Albany market. *In NEW JERSEY, All Access lays out the details of the transaction that moves WKOE (106.3 Ocean City) officially into Press Communications' hands: Press will pay Millennium $4 million for the class A signal, after Millennium pays Ocean Communications $900,000 to complete its LMA-to-purchase deal. Over at Millennium's WSJO (104.9 Egg Harbor City), Marilyn Russell takes over as MD/midday host; her resume includes stops at Philly's WXPN, WDRE, WPLY and most recently WMGK. VerStandig says it's taking a $1 million loss on the sale; the company plans to move the WCBG calls and CNN Headline News format to what's now WHGT (1380 Waynesboro), a 1000-watt daytimer that's simulcasting VerStandig's WSRT (92.1 Mercersburg). One new callsign in the Keystone State: Family Life Ministries gets WCIG for its new 91.3 in Carbondale, which should be on the air soon. *Over in CANADA, Lee Dunbar retires on Boxing Day (that's December 26 for us statesiders) after a half-century in Hamilton radio. He's spent the last 37 years at CHML (900 Hamilton), most recently as host of "Memory Lane" on Sunday afternoons.